These are stitch patterns such as might be found in a stitch dictionary. They are not patterns for finished objects. You will need to add selvedges or some other form of knitted stitches to either side. 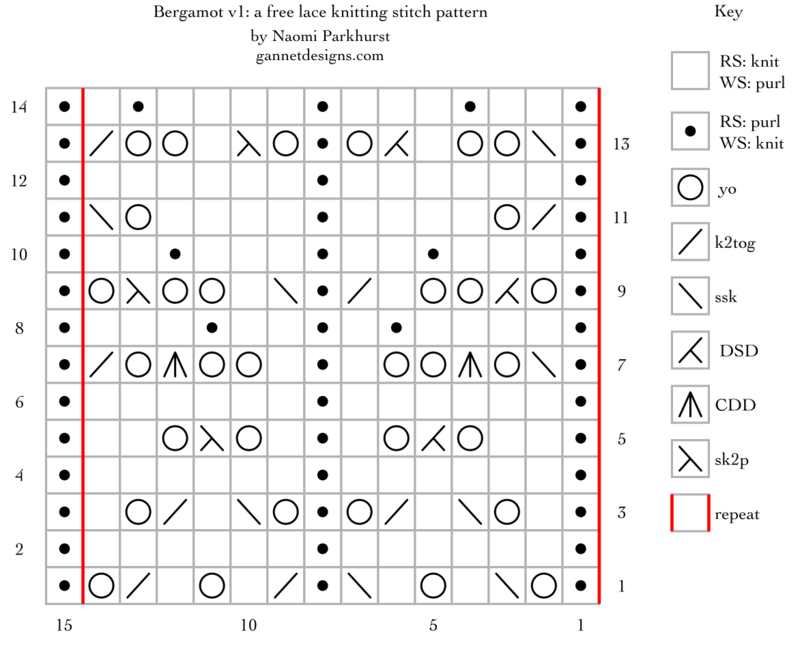 Bergamot is a multiple of 14 + 1 stitches. Version 1 is a multiple of 14 rows; version 2 is a multiple of 28 rows. There is one slight variation between them in the decreases. 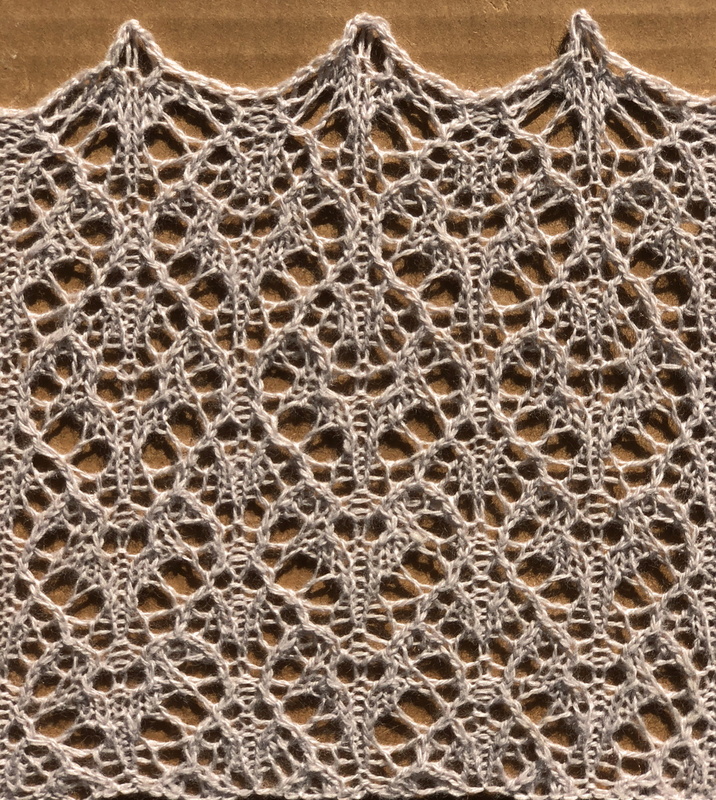 Version 1 is shown at the bottom of the swatch; version 2 at the top. Row 1 (RS): *p1, yo, ssk, k1, yo, k1, ssk, p1, k2tog, k1, yo, k1, k2tog, yo; work from *, p1. Row 2 (WS): k1, *(p6, k1) x 2; work from *. Row 3: *p1, k1, yo, ssk, k1, k2tog, yo, p1, yo, ssk, k1, k2tog, yo, k1; work from *, p1. Row 4: k1, *(p6, k1) x 2; work from *. Row 5: *p1, k2, yo, DSD, yo, k1, p1, k1, yo, sk2p, yo, k2; work from *, p1. Row 6: k1, *(p6, k1) x 2; work from *. Row 7: *p1, ssk, yo, cdd, yo x 2, k1, p1, k1, yo x 2, cdd, yo, k2tog; work from *, p1. Row 8: k1, *p3, (k1, p1) in double yo, p1, k1, p1, (k1, p1) in double yo, p3, k1 ; work from *. Row 9: *p1, yo, DSD, yo x 2, k1, k2tog, p1, ssk, k1, yo x 2, sk2p, yo; work from *, p1. Row 10: k1, *[p2, (k1, p1) in double yo, p2, k1] x 2; work from *. Row 11: *p1, k2tog, yo, k4, p1, k4, yo, ssk; work from *, p1. Row 12: k1, *(p6, k1) x 2; work from *. Row 13: *p1, ssk, yo x 2, k1, DSD, yo, p1, yo, sk2p, k1, yo x 2, k2tog; work from *, p1. Row 14: k1, *p1, (k1, p1) in double yo, p3, k1, p3, (k1, p1) in double yo, p1, k1; work from *. Row 1 (RS): *p1, ssk, k1, yo, k1, ssk, yo, p1, yo, k2tog, k1, yo, k1, k2tog; work from *, p1. Row 3: *p1, yo, ssk, k1, k2tog, yo, k1, p1, k1, yo, ssk, k1, k2tog, yo; work from *, p1. Row 5: *p1, k1, yo, sk2p, yo, k2, p1, k2, yo, DSD, yo, k1; work from *, p1. Row 7: *p1, k1, yo x 2, cdd, yo, k2tog, p1, ssk, yo, cdd, yo x 2, k1; work from *, p1. Row 8: k1, *p1, (k1, p1) in double yo, p3, k1, p3, (k1, p1) in double yo, p1, k1; work from *. Row 9: *p1, ssk, k1, yo x 2, sk2p, yo, p1, yo, DSD, yo x 2, k1, k2tog; work from *, p1. Row 11: *p1, k4, yo, ssk, p1, k2tog, yo, k4; work from *, p1. Row 13: *p1, yo, sk2p, k1, yo x 2, k2tog, p1, ssk, yo x 2, k1, DSD, yo; work from *, p1. Row 14: k1, *p3, (k1, p1) in double yo, p1, k1, p1, (k1, p1) in double yo, p3, k1 ; work from *. 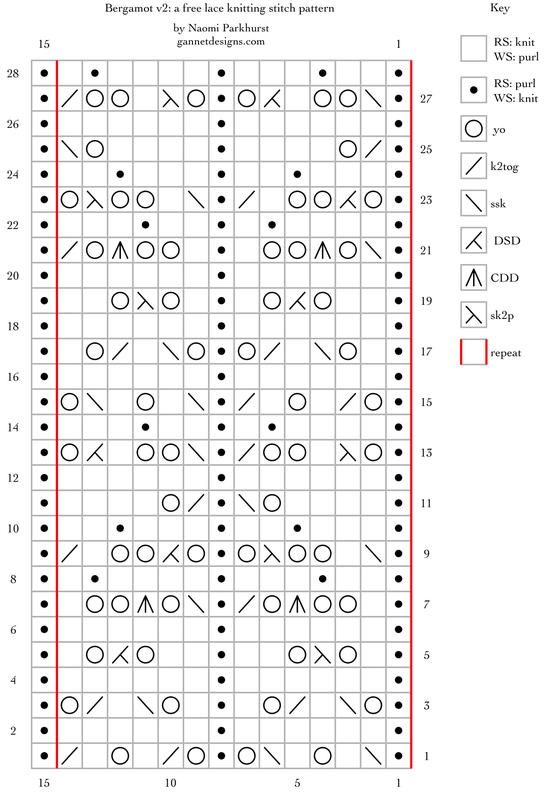 Row 15: *p1, yo, k2tog, k1, yo, k1, k2tog, p1, ssk, k1, yo, k1, ssk, yo; work from *, p1. Row 16: k1, *(p6, k1) x 2; work from *. Row 17: *p1, k1, yo, ssk, k1, k2tog, yo, p1, yo, ssk, k1, k2tog, yo, k1; work from *, p1. Row 18: k1, *(p6, k1) x 2; work from *. Row 19: *p1, k2, yo, DSD, yo, k1, p1, k1, yo, sk2p, yo, k2; work from *, p1. Row 20: k1, *(p6, k1) x 2; work from *. Row 21: *p1, ssk, yo, cdd, yo x 2, k1, p1, k1, yo x 2, cdd, yo, k2tog; work from *, p1. Row 22: k1, *p3, (k1, p1) in double yo, p1, k1, p1, (k1, p1) in double yo, p3, k1 ; work from *. Row 23: *p1, yo, DSD, yo x 2, k1, k2tog, p1, ssk, k1, yo x 2, sk2p, yo; work from *, p1. Row 24: k1, *[p2, (k1, p1) in double yo, p2, k1] x 2; work from *. Row 25: *p1, k2tog, yo, k4, p1, k4, yo, ssk; work from *, p1. Row 26: k1, *(p6, k1) x 2; work from *. Row 27: *p1, ssk, yo x 2, k1, DSD, yo, p1, yo, sk2p, k1, yo x 2, k2tog; work from *, p1. Row 28: k1, *p1, (k1, p1) in double yo, p3, k1, p3, (k1, p1) in double yo, p1, k1; work from *.